Friday Evenings criteria include a) play or watchability, and b) fun for all ages! 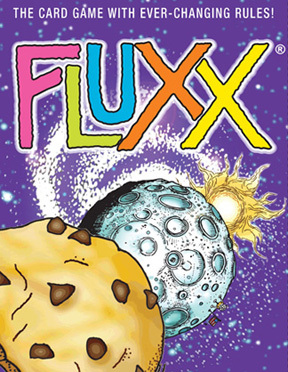 Fluxx is a card game created by Andrew Looney and published by Looney Labs. It’s called Fluxx because… well, the rules are constantly in flux throughout the game. However, this sounds far more complicated than it actually is. In Fluxx, there are five types of cards in the core game – New Rule, Action, Keeper, Creeper, and Goal cards. There’s also the Basic Rules card, which is placed in the center at the beginning of the game. Gameplay is simple – on your turn, you draw one card, and you play one card. Of course, the rules will start changing fairly quickly. However, gameplay is still fairly easy – generally, it’s just draw and play cards. Expansions and different versions will change the game in different ways, but the general idea is the same. Action cards allow one-time actions, such as removing a rule or stealing cards. Examples include Rules Reset (resetting the game back to the Basic Rules of draw one, play one,) and Draw 2 and use ’em. Keeper cards are used to meet the end goal. Examples include Bread, Chocolate, Dreams, and Toaster. Goal cards state the current requirements to win. For example, the goal Squishy Chocolate requires a player to have both the Chocolate and The Sun keepers in front of them. Usually, only one goal is in play at once, unless the rule Double Agenda is in play – then two goals are active at once. Goals change just like the rules, so keep an open mind to changing strategies. There are multiple versions of Fluxx. There’s the original version (this one), Pirate Fluxx (which I have), Star Fluxx, Zombie Fluxx, Cthulhu Fluxx, Monty Python Fluxx… the list goes on. The best part? Some of the packs can be combined with the base game to create a “Mega-Fluxx” game, as the card backs are the same. That’s right, you can have a Pirate Zombie Monty Python Fluxx game. I’d recommend Fluxx for ages 9 and up due to the ever-changing rules and goals requiring quite a bit of strategy. Games can take anywhere from 15 minutes to an hour, depending on how the rules and goals play out. Gameplay is a bit complicated, but this is approximately how it goes. At the beginning of the game, eight “loyalty” cards are dealt out – seven “loyal” cards and one “traitor” card. With a player cap of seven, not every game will have a traitor. I also recommend taking out the traitor card for games of three or four to avoid unbalancing the game. Each player then takes a heroic action. A few of these are a) moving to or from a quest, b) playing a “special white” card, or c) accusing one knight of being a traitor. If the player is in Camelot, they can also fight a siege engine or draw two white cards. You can also choose to sacrifice health to perform a second, different heroic action. Each player also has a “special power”, which can be used once per turn in addition to their heroic action(s). The game board has many different locations, each with a quest. At the beginning of the game, these are Camelot; the Wars against the Picts and the Saxons; the Black Knight; and the quests for Excalibur, Lancelot’s Armor, and the Holy Grail. Once the quest for Lancelot’s Armor has been won or lost, the knights can fight the Dragon. If quests are completed successfully, white swords are added to the Round Table. If the quest is failed, black swords are added to the table. The game ends once the Round Table is filled with twelve swords. If there are more white swords than black, the knights win. However, the loyal knights will lose if twelve siege engines surround Camelot, they all die fighting the forces of evil (obviously), or there are more black swords than white on the Round Table. Long story short, our family isn’t really into competitive games. We’ve become a cooperative game family – it saves feelings. Rather than two or three people getting crushed during a game of Catan or Risk, everyone wins or loses in games like Pandemic. Pandemic is an interesting game. 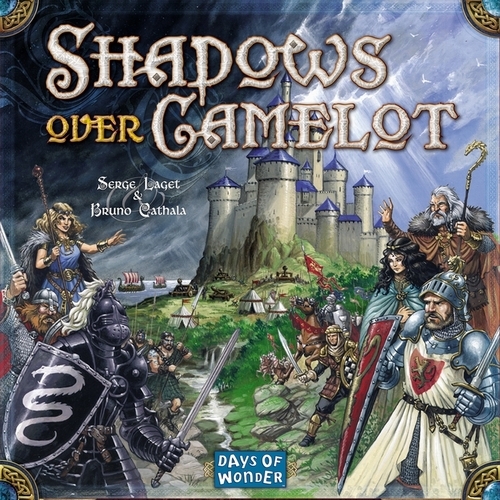 Originally created by Matt Leacock, it was published by Z-Man Games in 2008. There are two expansions – In The Lab and On The Brink. I’ve only ever played the original (box art above), so that’s the only one I’ll be talking about. 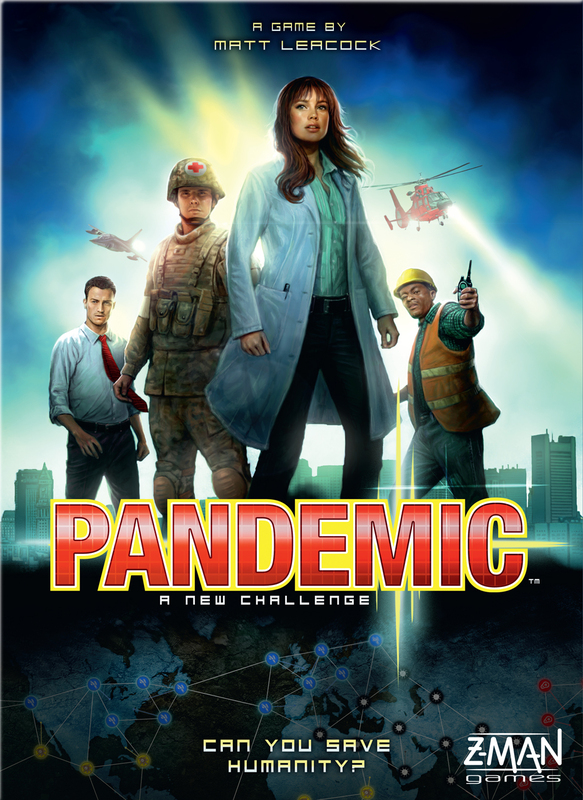 Pandemic includes a game board representing the city network on Earth, two decks of cards (Player cards and Infection cards), four colors of disease cubes, six Research Stations, and a pawn/role card for each player. The Player deck includes city cards (the same cities as on the board,) beneficial Special Event cards, and Epidemic cards. Infection cards have city cards (one for each city on the board) with the color of the disease t0 be placed there. Before starting the game, Infection cards are drawn to populate the board with infections. Players start at Atlanta, (the home of the Center for Disease Control), and are given a random role and Player cards (the number given depends on the number of players). The game is lost if (1) more than 7 Outbreaks occur, (2) there are no more cubes of the required disease color, or (3) there are no Player cards left. The game is won if the players discover the cure for all four diseases. To help with winning the game, the roles players are given have special abilities. For example, the Medic can treat all disease in a city with one action, or if the cure has been found, they can cure it just by walking through. Also, the Special Event cards are your friends. They can build a much-needed Research Station or skip an infection round, among other things. I’m going to stick with the game recommendation of 10 and up for this one, though you could probably go as young as 8. The game itself is totally clean and just plain fun. Friday Evening criteria include a) play or watchability, and b) fun for all ages! This Friday Evening, sit back, semi-relax, and try to out-settle your opponents in Settlers of Catan! Settlers of Catan is a competitive game. The goal is to get to ten Victory Points before everyone else – but remember to manage your resources well, and watch out for the Robber! The game is for 3-4 players, (5 and 6 players with extra player expansions) and is randomized every game in terms of where resources are. This is a super fun game that usually takes anywhere from 60-80 minutes, theoretically. (I’ve had games go over two hours.) It just depends on dice rolls and where resources are, as well as your use of special cards. On your turn, you roll the two six-sided dice, to find out which hexes produce resources. Any player with settlements or cities next to hexes marked with the number rolled receive resource cards of the appropriate type. Players can also trade resource cards with each other; players may also trade off-island (with the bank) at a ratio of four to one resource for one of any other. By building settlements by marked ports (near the edge of the board,) the ratio for that player goes down to three-to-one, or two-to-one, determined by the port’s location. You can also spend resource cards to buy development cards, which include soldier cards (allowing you to move the robber as if a 7 had been rolled,) cards worth one victory point, and cards that grant you one of three abilities when played. You win by getting 10 victory points first. Settlements are worth one, cities are worth two, and extra victory points are attainable through having the longest road or the largest army. Overall, this is a really fun game, and a great party game. 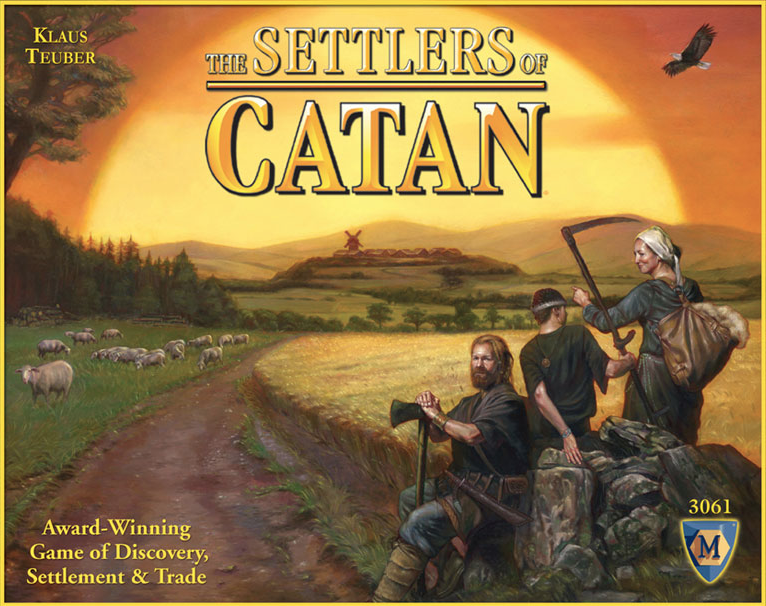 Catan also has several expansion packs, the major ones being Traders and Barbarians, Cities and Knights, and Seafarers. I have only ever played Seafarers – friends tell me that Cities and Knights makes the game super complicated, expanding the role of cities. I have not heard a lot on Traders and Barbarians, but it changes the game mechanics, just like the other expansion packs. The expansion packs can be combined with a bit of creativity as to rules, and if you don’t mind a board two or three times as large. (This is a very large board game – card table is the best option, or a large dining room table.) If you want to play an expansion with 5 or 6 players, you need to get the extra player expansion for both the base game and the expansion you plan on playing with. I’d recommend this game for ages 10 and up, as long as you can plan ahead and have decent strategy skills. Have fun with your evening! This Friday Evening, sit back, semi-relax, and enjoy a cooperative game of Forbidden Island! 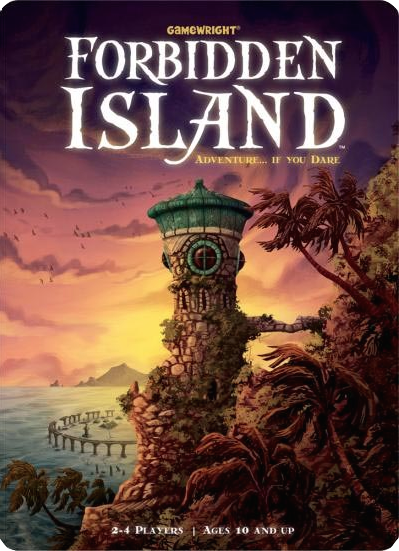 Forbidden Island is a cooperative game – everyone has to work together to beat the game, not each other. You all win or lose. Great for people who dislike being crushed in a game. Or, if you are crushed, everyone else is too. The game is for 2-4 players, and is randomized (like Catan) in terms of where everything is, and what characters are being played every time. The game revolves around an island that houses four mystical artifacts from an ancient civilization. However, they designed the island to sink if anyone ever tried to enter it. You play a group of adventurers, determined to get those artifacts, sinking island or not. This is actually a great game that usually takes anywhere from 25-40 minutes, depending on how well you do at moving around and keeping everything from sinking. I wouldn’t say it’s easy, but it’s definitely less challenging at lower difficulty levels. It’s really just how good your strategy and cooperation is, and luck of the draw in cards. Player 2 continues with their turn. You win by getting all four artifacts rescued, getting everyone back to Fool’s Landing, and discarding a Helicopter Lift card when everyone gets there. You can lose if someone is on a sunken tile with nowhere to go, if the island sinks before you get off, or if both treasure tiles for an unclaimed treasure sink before the treasure in question is claimed. Overall, this is a pretty fun game, and a great intro to cooperative games as a whole. Pandemic, Shadows over Camelot, and Lord of the Rings (yes, the board game!) are some of my other favorites. I’d recommend this game for ages 9 or 10 and up, really depends on the child in question.